Marcus enjoying his new scooped bed by FF. Lydia playing peek a boo in new mouse hole. 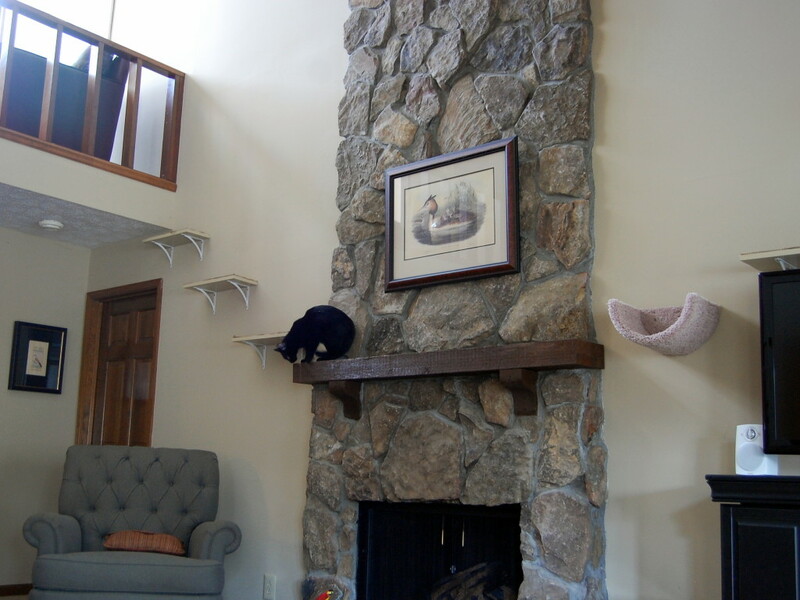 Per the client's request we utilized the mantle as part of the runs. 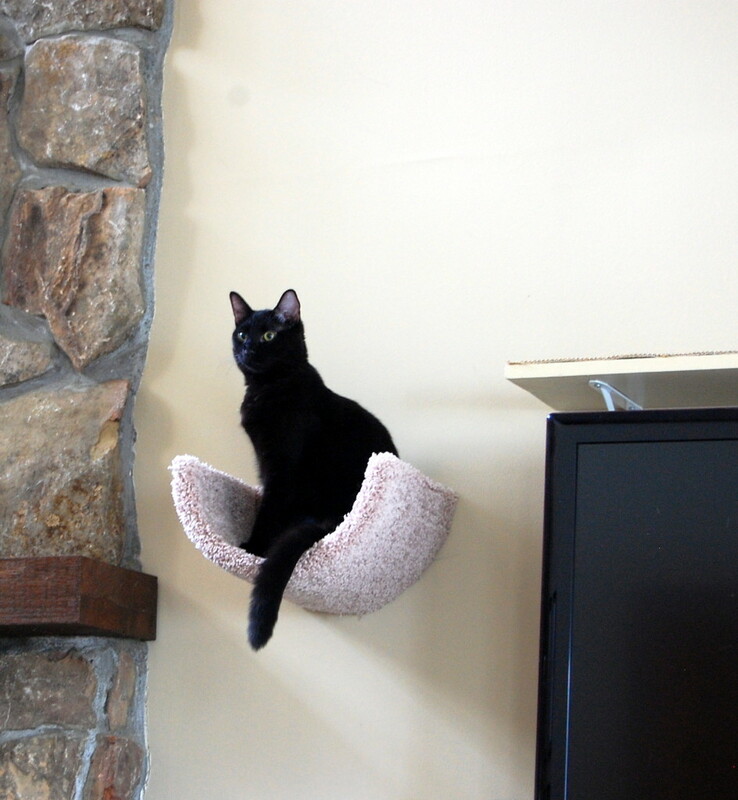 Custom built vertical space by Fundamentally Feline. Check out more from this house on the Vertical Space page! "Ok, this is a long testimonial but I’ve been I’ve been tapping Ingrid for advice for the past few years as our “herd” of cats has continued to grow. Warning: fostering kittens is a total blast but only the most hard hearted can refrain from keeping just one (and then another). I heard about Ingrid through the rescue group that I volunteer for. 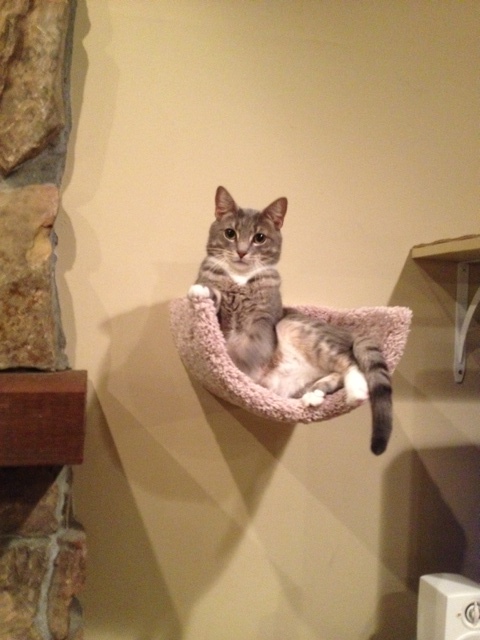 When an adopted cat had behavior problems in their new home, Ingrid was often called in to help out. So, when my own kitties were having issues I knew who to call. 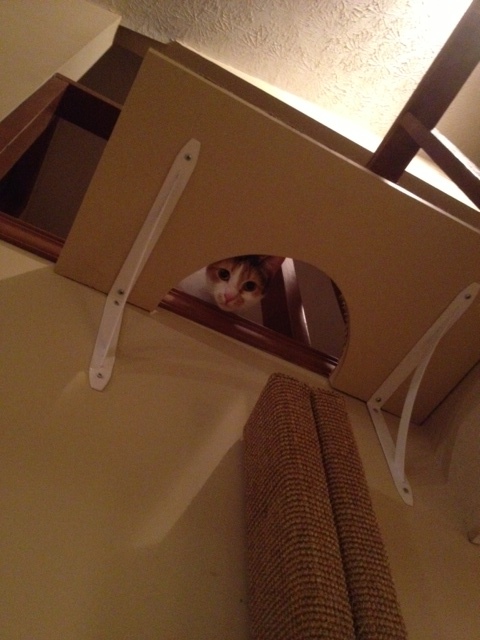 Although I thought I was a pretty savvy about cat care, I learned a great deal during our in-home consultation. What I appreciate most is that she has practical and scientifically sound advice based on years of experience and formal training in animal behavior that draws on the sorts of things I learned in college- like operant conditioning-remember Psychology 101 and Pavlov’s dog? Fortunately cats are a lot easier to train than humans. Anyway, I thought I was pretty observant and had a really clean house but, to my horror, Ingrid found some flea “dirt” and some live fleas, yuk!! She gave us info on how best to treat our home with a pet safe and environmentally friendly yet highly effective product and showed us how to prevent fleas in the future. She also had plenty of suggestions for improving the environment to address cat aggression and peeing outside the box issues including types of litter boxes (yeah, you need more than one!) and placement of the boxes. In the past, we had a cat who was tolerant of using a single litter box in the basement that was scooped out somewhat less than regularly. Our new kitties sent us a message that this was not acceptable to them. Oh yeah, and they wanted them cleaned out a lot more often (are you kidding me? cleaning out a litter box?) OK, OK. While we had a bunch of cat trees, Ingrid suggested increasing vertical space. 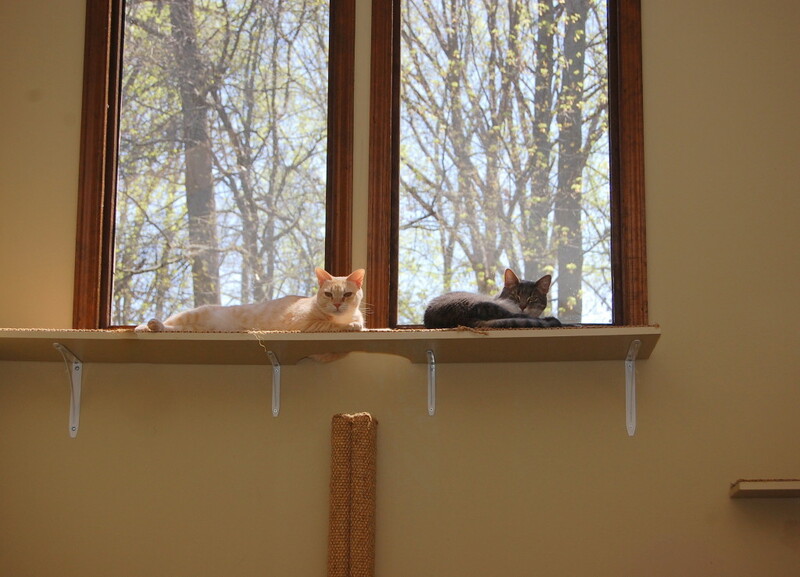 Her husband Jake installed a number of cat climbing shelves and sisal covered poles which he painted the same color as the wall. Most visitors to the house don’t even notice them at first until they see the kitties race up the poles and romp around their elevated super highway. It’s a huge entertainment factor in our house for humans and felines. She also made suggestions in changes in our feeding routine. One of our male cats had a blocked urinary tract, a painful, life threatening condition which was very costly to treat. It turns out that the type of food I was giving them was most likely the culprit- sure wish I had known that sooner! We’re now using the food that she recommends. And the cats are now busy with their foraging toys, some of them seem to prefer to “work” for their food. She also thought that our feeding routine was contributing to cat aggression and we changed from setting out one bowl of wet food per cat (all in the kitchen) to a strategy of putting out only 4 or 5 bowls (yes, we have a bunch of cats!) which are placed in different spots around the house. Honestly, how on earth could that really make a difference? There didn’t seem to be much aggression when they were eating in the same room! But within a day, the peeing outside the box stopped. I still can’t wrap my brain around that one but am so happy about it! Also, many helpful tips on how to medicate them- yup, they really do line up to get their medication now that it's coated with their favorite treat. 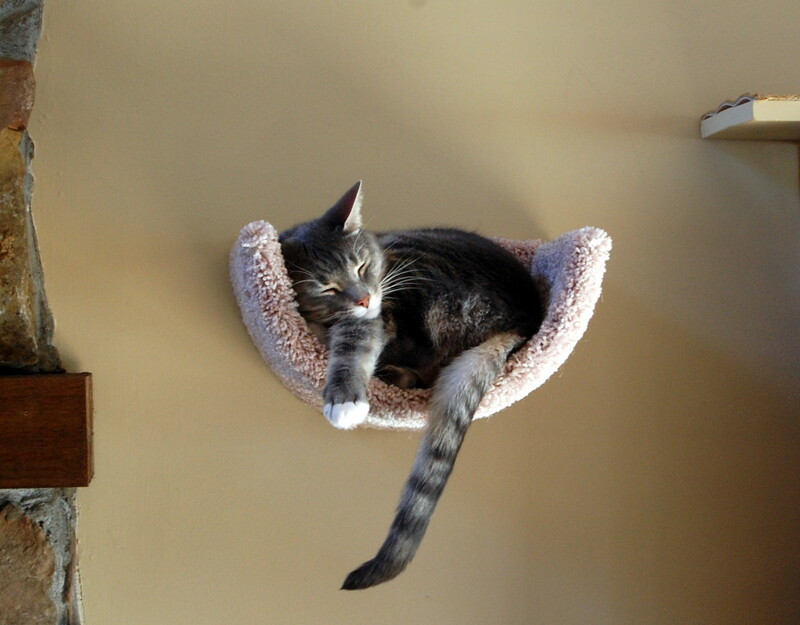 Warning: once you get hooked on environmental enrichment it become addictive, there are so many possibilities of cool things you can do for you cats!